Space planning ideas for wellbeing at work! 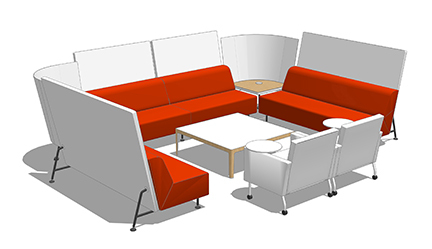 Space planning ideas for wellbeing at work. Today wellbeing encompasses much more than just physical wellness and includes the cognitive and the emotional aspects of being “well”. Employees that are static, overloaded with information, and feeling constantly stressed are not innovative individuals – and that directly impacts the bottom line. With so much time spent “at work” and the huge impact that technology has on our life, it becomes imperative to seriously consider how to address all aspects of wellbeing in space design. We pulled together a couple of space planning ideas to help address the 3 types of wellbeing. Static sitting can cause slowed metabolism, neck pain, back pain and reduced concentration, impacting mental and cognitive abilities. Engaging the body in movement is essential for supporting physical and mental vigor at work. Changing posture stimulates the mind. Employees are working longer hours, so it’s critical to offer a variety of indoor and outdoor spaces that offer posture choices and encourage walking to create energy. And as the workforce ages, we need to understand what other changes are necessary in terms of lighting, acoustics and adjustability. 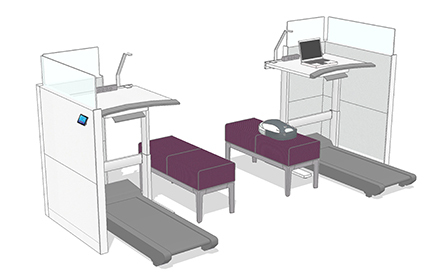 Many organizations are incorporating walkstations in their workplaces to give people the opportunity to stay moderately active throughout the day. In addition, moving from sitting to standing postures throughout the day, by giving employees adjustable height desks, can alleviate back stress and discomfort. And lastly, the Gesture chair was actually designed to address our different postural needs as we interact with technology. Information is coming at us constantly. On top of that, our workplaces have become increasingly compressed and the open plan presents continual distractions. Our thinking is interrupted as often as every three minutes. Even brief interruptions of just a few seconds causes us to make twice as many mistakes. And after our focused work is interrupted, it can take up to 23 minutes to get back into flow—the state of being deeply absorbed in our work and focused. Creating spaces that support focus, respite and relaxation during the work day are essential to cognitive wellbeing. The Brody Lounge chair (above) is a great solution for building quiet spaces into the open plan. 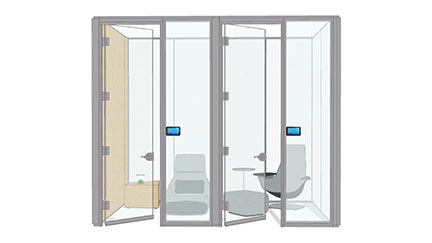 The cocoon like privacy screens block sight lines and mitigate those constant distractions and interrruptions. Of course using demountable wall systems like V.I.A. 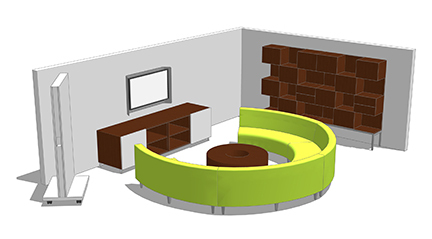 for small huddle rooms and team studios provides people with both acoustic and visual privacy. 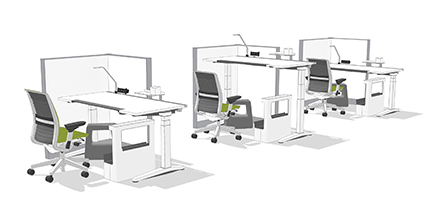 Individual workstations can also include privacy screens to help shield work and minimize visual distraction. It also helps create a sense of an “owned” place for individuals. Neuroscientists have learned that the quantity and quality of social interactions have significant impact on our wellbeing. When people don’t have enough quality interactions, they become more disengaged, which makes it harder to collaborate, innovate, solve problems and be open to change. Therefore, it’s critically important to ensure that people have meaningful connections to others, and understand that, wherever they are, they are valued in the organization. Creating places that allow everyone equal opportunity to communicate and contribute is essential to building the trust that is the currency of collaboration. 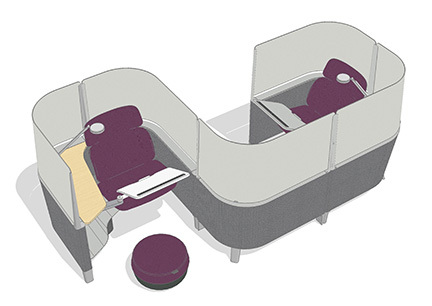 Lounge spaces such as the Bix Lounge (above) can be configured within an open office to create inviting vignette where people can decompress and relax comfortably. 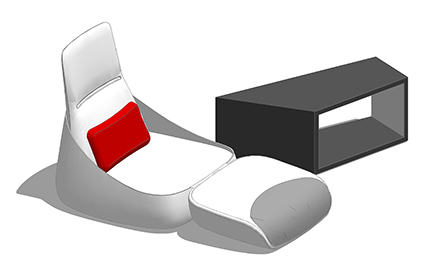 In fact, small lounge settings can be peppered throughout the space to give an alternate posture to sitting or standing. In many cases, companies are trading in their formal meeting rooms for lounge settings that allow participants to relax and share content democratically. Regardless of the solution that you choose, the main takeaway is that we have a much broader definition of what wellbeing encompasses today than in the past; there are a wide variety of planning ideas for the office that will help employees achieve balance and wellbeing at work! Town & Country: A fun workplace poised for growth.